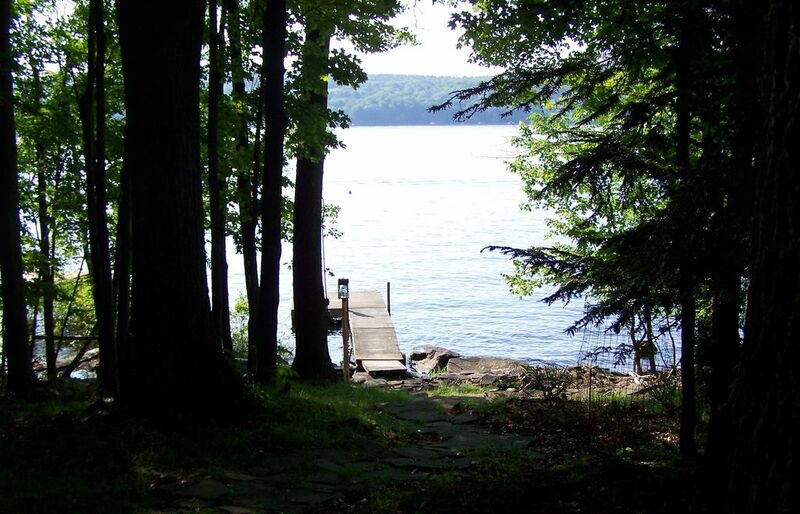 Nestled in the Pocono Mountains, this Rustic Cottage is situated in the Briar Hill South Community, which is on the Northwest shore of beautiful Lake Wallenpaupack. Gentle slope to the lake. It offers 75 feet of private shoreline including a boat dock, a swim dock, a campfire circle (for cooking S'mores! ), and a lakefront patio. The cabin has two bedrooms plus an open loft. The total accommodations are for six. It has a dining room, a living room with TV/DVD/VCR, a full bath, and a fully equipped kitchen with a full sized range, refrigerator, microwave and a BBQ grill outside. It has an attached deck with unbelievable views of the lake. Ample off-street parking is included. The cabin was exactly as shown in the picture. It is very comfy and clean y the lake. It had everything we needed to enjoy our coupe days away from home. Inside the cabin is very beautiful, warm and cozy. The fireplace works perfectly and we enjoyed sitting by it. Brian was so helpful with all my questions and he made sure we had everything we needed. We were 2 couples, one child and a puppy and the place was big enough for all of us. Can't wait to go back there. Absolutely adorable cottage! Nothing beat the views to the lake! A perfect getaway to just relax! Very peaceful and Brian was very good with addressing any problems we had. It was a very nice and comfortable place to stay . There was plenty of parking space . I would have enjoyed some basic tv just to stay in touch with the news and weather. Nice cozy lake house, we really enjoyed being on the lake. We did a lot of fishing and relaxing by the water. We enjoyed the outdoor seating by the fire at night. Perfect weekend getaway on the lake! Coming from Philly, New York city, and buffalo, we all enjoyed the peace and quiet. Our dogs loved swimming in the lake off the dock. We were able to have a fire and grill out on the deck. Brian was also very helpful/responsive leading up to our stay! House is right on the lake surrounded by woods. There were deer everywhere! Big dock. House was very clean. Enjoyed our stay and the quiet surroundings.